To develop globally minded citizens who have the knowledge, skills and attitudes to effect positive change in our world. 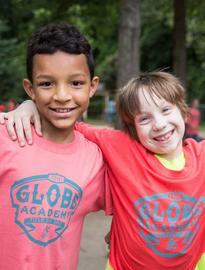 The GLOBE Academy fosters Global Learning Opportunities through Balanced Education for children of all backgrounds. With a focus on dual-language immersion, an experiential-learning model and a constructivist approach, GLOBE inspires students to be high-performing lifelong learners equipped to make a positive impact in the world. The GLOBE Academy’s core values are expressed in the acronym, CREST: Community, Respect, Empathy, Sustainability and Trust. These values are expected of the governing board, faculty, staff, parents, and students. They are woven into daily life at GLOBE and incorporated into the curriculum. Community: We are inclusive, and we nurture and support one another. Respect: We treat ourselves and each other with kindness and dignity. Empathy: We strive to understand and share the feelings of others. Sustainability: We aim to conserve our resources for optimal use in the present and future. Trust: We are committed to honesty, transparency, and respectfully sharing our thoughts and encouraging others to do the same.